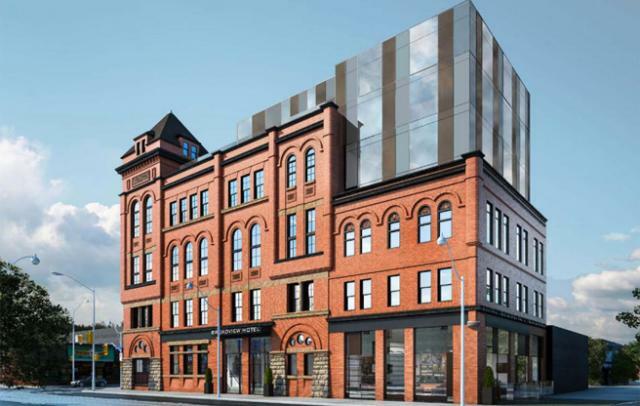 The Broadview Hotel is a 125 year-old building and historic neighbourhood landmark that is now being meticulously restored and reimagined as a 58-room boutique hotel and charismatic gathering spot. Behind its grand facade lies a unique, crafted hospitality experience that’s inspired by local culture and is infused with a contemporary yet old-world grace. Each and every detail has been carefully considered, from the design to the service, the amenities to the food and beverage program. Visitors and locals alike can enjoy an array of animated venue spaces, which include a restaurant, lobby- cafe/bar, rooftop terrace and private event facilities. With its lively energy and welcoming feel, The Broadview Hotel is set to take its place once again as an iconic piece of the Toronto landscape.